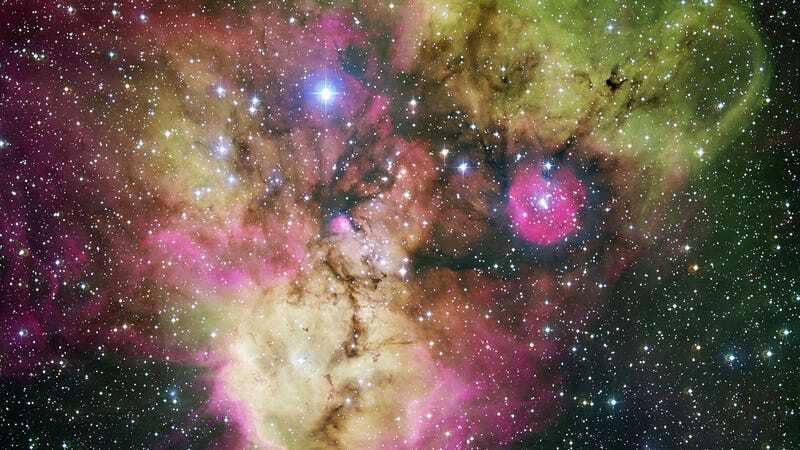 This is NGC 2467, an energetic star-forming region found in the constellation Puppis. This image from the European Southern Observatory captures a gorgeous range of colors and countless stars being born...but I just can't stop staring into the nebula's eyes. I'll admit, my pareidolia is probably working overtime on this one, but this nebula strangely resembles a tilted, somewhat quizzical face, with the bright blue star in the top center and the pink halo off to the right forming the two eyes, and the brownish collection of gas in the middle below them almost forming a nose. But my ability to see vague cosmic boogeymen aside, there's plenty to say about NGC 2467 that carries actual scientific merit. With an age of a few million years at most, it is a very active stellar nursery, where new stars are born continuously from large clouds of dust and gas. The image, looking like a colourful cosmic ghost or a gigantic celestial Mandrill, contains the open clusters Haffner 18 (centre) and Haffner 19 (middle right: it is located inside the smaller pink region - the lower eye of the Mandrill), as well as vast areas of ionised gas. The bright star at the centre of the largest pink region on the bottom of the image is HD 64315, a massive young star that is helping shaping the structure of the whole nebular region.